Richard was introduced to folk music through Folk Camps. 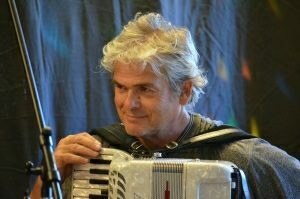 Richard plays currently accordion and piano with Climax Ceilidh Band and Moltenamba, and in the past played in Meridian and Angles. Before that he played bass guitar and piano in a number of rock bands including Climax Blues Band and Principal Edwards. Richard also runs the South East London Folk Orchestra. Expect his music workshops to bring in lots of different musical influences and to develop into glorious arrangements, which have a place for both beginners and experts. In the evenings, his driving rhythms on the accordion lead to ceilidh music that is great to dance to. Here is where Richard will be a member of staff this season. Follow the link to find out more. Find out about all the Folk Camps staff this season.